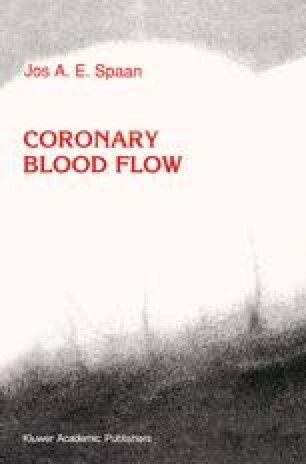 The Purpose of the coronary arterial tree, a branching network of vessels, is to distribute blood over the capillary bed and to regulate coronary flow. Regulation is exercised by the smooth muscle cells in the vessel walls, especially of the smaller arteries and arterioles. These smooth muscle cells are under the control of tissue metabolism and are able to adapt perfusion to local needs independently of the structure of the arterial tree. However, the architecture of the arterial tree determines the potential for the distribution of blood flow, which then is modulated by control. The magnitude by which vessels of certain diameter may contribute to the control of flow depends on their contribution to overall resistance. This can be inferred from the pressure distribution over the coronary arterial tree. If the drop of pressure over vessels with a certain diameter is negligible, their potential to alter flow significantly will also be very slight. Theoretically, the resistance of a vessel can readily be estimated from its length and diameter, applying Poiseuille’s law and neglecting entrance effects and peculiarities of rheology. However, the vessel’s contribution to the overall resistance and its potential to alter flow distribution depends strongly on the structure of the network and the position of the vessel in it. A good test of whether the relation between structure and function of the arterial tree is understood follows from the comparison between the experimentally determined pressure distribution and its prediction on the basis of the structure of the arterial tree.